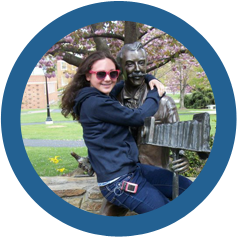 I’m a sophomore at Elizabethtown College. I’m studying mass communications and interested in a career in journalism. I’m a fun-loving college student with a passion for writing, communication and music. Self-expression is very important to me, whether it’s with words, fashion, song, or insulin pumps. I was diagnosed in 2001, and I was five years old. I have a collection of over 70 pairs of Converse sneakers! I chose the Animas® insulin pump because it looked like the easiest for me to use, as a 7 year old, and I could decorate it with the neat stickers and cases that Animas made. I love the remote access the Ping allows me from my glucometer. I thought it would make sports and wearing dresses a lot easier, and it has lived up to that expectation! And the best part, it’s pink! What is the best part about being in college? I love being an Elizabethtown communications student because I am learning all kinds of useful information about the world of the media and gaining a set of applicable skills that will be useful when I want to find a job. If I’m being honest, I felt like a pin cushion. With checking my blood sugar twelve times a day, then my seven insulin injections on top of that, I was poking myself with needles all day long. My blood sugars weren’t what I wanted and needed them to be, and since I was so active, the bruises from the injections often made it painful to participate in the sports that I loved. Beyond that, I loved school, and I hated having to miss so much class in order to wait for my school nurse to help me take my shots. I had a friend in elementary school that had an insulin pump, and watching him drop in and out of the nurse’s office so quickly helped me see that there was a better, easier, and more flexible option for my diabetes care. The main challenge for me is making sure that I’m always prepared for anything that could go wrong: making sure I always have enough insulin and an extra site change, as well as juice in case I go low. Having diabetes takes away the spontaneity of my life, but taking the extra few minutes to prepare is better than being up a creek without a paddle…or my adequate diabetes supplies! At my age, whether they are newly diagnosed or have had diabetes for a while, I see a lot of people who are embarrassed by their diabetes. They try to hide it from their friends, and they are ashamed because they think there is something wrong with them. To them I would say this: Embrace it. When it comes to taking care of your diabetes, you absolutely must give it your all. It’s okay to tell people about it. In fact, the more people that know about it, the safer you’ll be. Your life with diabetes is what you make it, but before anything else, it must be controlled. Then and only then can you follow your dreams.